In 1906, Peter Kaisen who was part of an expedition from the American Museum of Natural History led by Barnum Brown discovered the first fossils to be identified as Ankylosaurus. These were found in the Hell Creek Formation, near Gilbert Creek in Montana. The fossils found included the upper part of the animal's skull, two teeth, part of the shoulder girdle, many vertebrae, ribs, and osteoderms (the bones that form part of Ankylosaurus's armor). 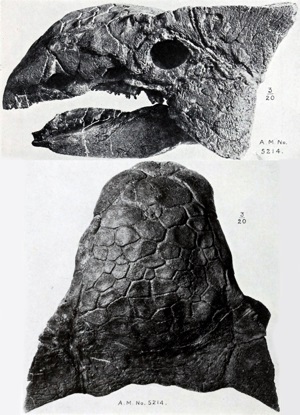 Based on this first specimen, Barnum Brown wrote the first scientific description of the animal in 1908, and gave it the genus name "ankylosaurus" which means "stiffened lizard", "bent lizard" or "fused lizard" - the name refers to the medical condition of ankylosis (which is a stiffness of joints caused by injury or disease). Barnum choose the name "magniventris" for the species name, and this means "great belly" in reference to the width of the animal's body (the Latin word "magnus" means "great", and the Latin word "venter" means "belly"). In his 1908 scientific description, Barnum Brown included a picture of a skeletal reconstruction. Based on incomplete remains, Barnum Brown depicted the animal with an arched back (similar to stegosaurus), without the tail club (which was unknown at the time), and with armor running down the animal's back in rows (purely speculative/hypothetical). 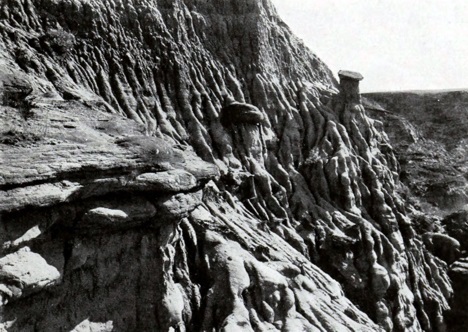 Interestingly in his 1908 paper, Barnum Brown also referred to some osteoderms that he had previous found in an excavation of the Lance Formation of Wyoming in 1900. These osteoderms had been found mixed with a Tyrannosaurus rex skeletion, and were wrongly thought to be part of the same animal - supposedly an armored version of Tyrannosaurus rex, which Barnum Brown called " Dynamosaurus imperiosus". Today however, it is believed that these osteoderms probably came from an Ankylosaurus (or perhaps a close relative) which had formed the Tyrannosaurus's last meal. In 1910, another expedition from the American Museum of Natural History also led by Barnum Brown, discovered a second Ankylosaurus specimen in the Scollard Formation by the Red Deer River in Alberta, Canada. This specimen included a complete skull, mandibles, ribs, vertebrae, limb bones, and armor, as well as the only Ankylosaurus tail club so far found. Another Ankylosaurus specimen was found in 1947, about 0.6 miles (1 kilometer) North of the 1910 specimen, by Charles Mortram Sternberg and T.P. Channey. The specimen consists of the largest known Ankylosaurus skull - however it is badly preserved. 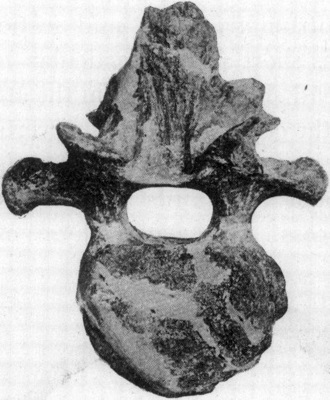 Caudal vertebrae of Ankylosaurus were also found in the 1960s - these were found in the Powder River drainage, Montana, which is also part of the Hell Creek formation. Finally, as well as these five incomplete specimens, many isolated osteoderms and teeth have also been found.